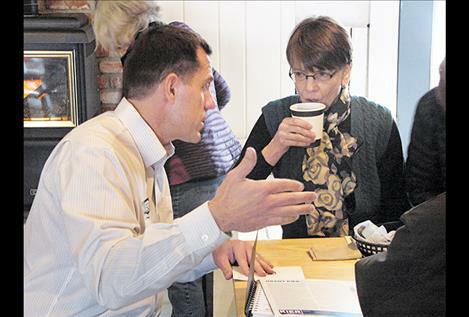 Grant Kier talks with attendees at Blodgett Creamery & Coffee Saloon on Feb. 5. POLSON — Grant Kier came to town last week and touted his collaboration skills. 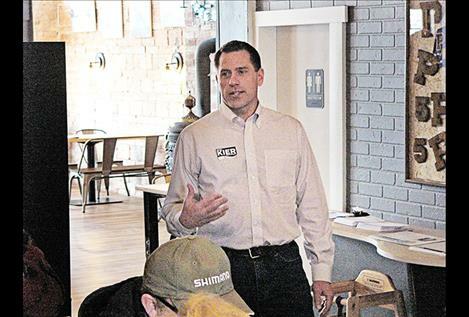 Kier, 42, is one of five Democrats running for their party’s nomination on June 5 to challenge Republican U.S. Rep. Greg Gianforte in November. Kier, who grew up in Boulder, Colorado, has worked as executive director of land trusts in the Bitterroot Valley and Missoula. In these jobs, Kier said he worked with farmers and ranchers to protect land for conservation and agriculture. Kier, who has a master’s degree in geology, said he just finished paying his student loans last December. He said he decided to run for Congress because the nation needs people who will mend fences and not build walls. 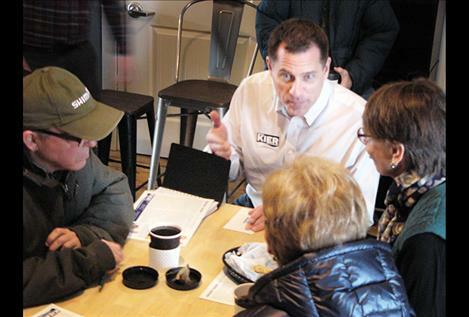 In regard to guns and gun control, he said this is “one of the toughest issues we face as Democrats in Montana. I’ve held a gun in my hands since I was old enough to walk,” he said, noting he was raised by two farming families. However, he does support banning bump stocks, which can be added to a semi-automatic rifle to make it fire easier and simulate an automatic weapon. “I think it’s a loophole we need to shut,” he said. Although he said there’s a lot he doesn’t know, Kier said he isn’t afraid to ask for help. He also said he can be blunt when answering questions. When asked how he distinguishes himself from his Democratic primary opponents, Kier gave three reasons. “We need independents and moderate Republicans to believe in us,” he said, noting his work with farming and ranching families. He has raised more money than any other candidate ($440,000) when one doesn’t count the $200,000 that John Heenan contributed to his own campaign. Heenan has raised $580,000. Kier also noted his work on the last two federal farm bills, which he said made positive contributions for conservation in Montana. In addition to Kier and Heenan, the others running for the Democratic nomination include: former state Sen. Lynda Moss of Billings, former state Rep. Kathleen Williams of Bozeman and Jared Pettinato, a Whitefish native who worked as an attorney for the U.S. Department of Justice in Washington, D.C.
Kier said that he is committed to hosting four town halls with constituents a year if elected and has said he challenged Gianforte to do the same.